DevNet Create is starting on April 10, 2018, and I’ve been spending time looking at all the speakers, sessions, tech talks and workshops. I’m an industry analyst, but I’m also a user and tester of Internet of Things (IoT) platforms both for work and at home. I spend a lot of time learning about and using IoT technology microservices like edge processing tools, device management platforms, analytics platforms and more. And DevNet Create is a great place to expand my industry knowledge. There’s a ton to do at DevNet Create, so I figured I should get organized ahead of time. 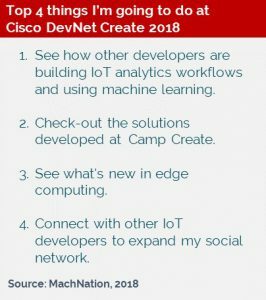 Here are the 4 things that I’m really excited to do and learn at Cisco DevNet Create. See how other developers are building IoT analytics workflows and using machine learning. Ingesting and collecting IoT data is only the first stage of a successful IoT solution. Turning that collected data into business intelligence is the key to deriving real-world value from IoT. I’m keeping an eye out for demos and talks relating to machine learning and analytics visualizations, such as Louis Frolio’s and Ashley Troggio’s talk: IoT & Edge Analytics Demystified: Build It Today! Check-out the solutions developed at Camp Create. Camp Create is a 2-day opportunity for participants in teams to use Cisco technology to design solutions that address real-world use case. I’m guessing Cisco will put together teams of developers with complementary skills and interests. It’ll be cool to see the types of solutions they design in 2 days: there’s nothing like a deadline to get a team of developers to focus on a goal. What will be really great, is to see this solutions released to the general public after the event! See what’s new in edge computing. Cisco and its partners do a lot of work in edge and fog computing and sometimes it’s hard to stay up-to-date. How exactly are companies implementing hybrid or converged cloud/edge solutions in the real-world today? 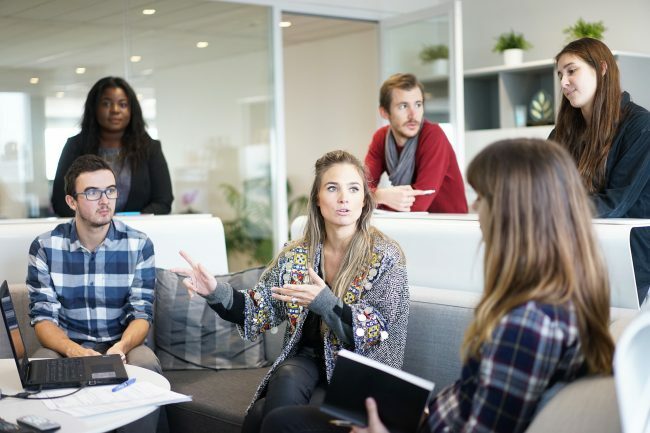 What are the biggest benefits this technology is providing to enterprises? Are we moving to completely distributed/serverless architectures? Or does the traditional server-client model still have some life left in it? I’m excited to learn everything I can about these novel IoT solutions at DevNet, both from Cisco, its partners and all of the various tech talks and workshops on offer. Connect with other IoT developers to expand my social network. One of the greatest benefits to any industry event is meeting cool new people! With many different IoT firms in attendance, along with a huge number of independent developers and enthusiasts, wandering the showroom floor and striking up conversations is always a great way to build out my social network. I’m always looking for great conversations. Sometimes it’s just fun to geek-out over the latest and greatest tech. Especially with the backdrop of the Computer History Museum, I expect to have many fun conversations about the current state and the future of IoT. If you’re going to be at DevNet Create and want to chat about hybrid edge/cloud solutions, IoT data analytics or novel machine learning applications definitely hit me up! I’ll be giving a Tech Talk on April 10th at 4:00 PM about hybrid IoT edge/cloud platform deployment. Or find me learning about the real-world solutions developed at Camp Create!